The Demonetisation move is still fresh in our minds due to many reasons. 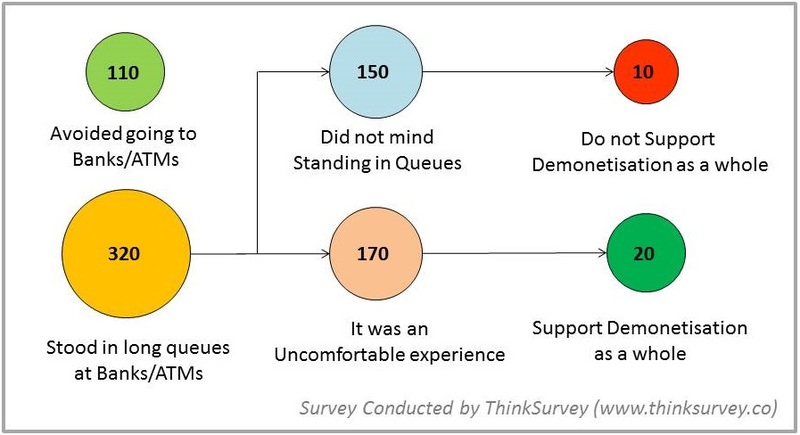 To understand what people of India have to say about Demonetisation ThinkSurvey executed a survey starting from 1st January 2017 onwards for exactly 15 days. A total of 430 participants submitted their opinion for the same. According to Reserve Bank of India (RBI) data, the total value of Rs 500 and Rs 1000 notes that were in circulation was Rs 14.18 lakh crore, as on end March 2016. 200 out of 430 participants doubted that Demonetisation will be helpful in bringing back black money. Only 39% (i.e 170 participants) showed their support in positive. However, according to estimated numbers (RBI’s official report is yet to come on this), as on 31st December 2016 India has successfully pulled back Rs.14 lakh crore of banned currency notes. This is almost 98% of the total figure. The remaining 2% is still a substantial amount. Out of those 200 participants in negation, 10 supported Demonetisation as a whole while 20 participants were still undecided. Of the 430 participants in our survey, 320 participants stood in long queues at ATMs and Banks. The remaining 110 participants choose other ways of transactions to avoid queues. According to the data, they stood for average 20-30 minutes before their turn could come to make a successful transaction. Of these 320 participants, 150 did not mind standing in line while 170 stated it to be an uncomfortable experience for them. We also asked them how much change in purchase behavior they had brought post demonetisation decision. 120 participants have increased making more of online transactions; while 160 participants have stopped making purchases which involves cash. Remaining 150 participants mentioned that their types of transactions are not being done online as of now; thus they are still depending on cash. This is the most important question lurking in everybody’s mind. At the end of our Survey conducted on Demonetisation 53% participants (i.e 230 out of 430) have shown their support; while 170 participants (i.e. 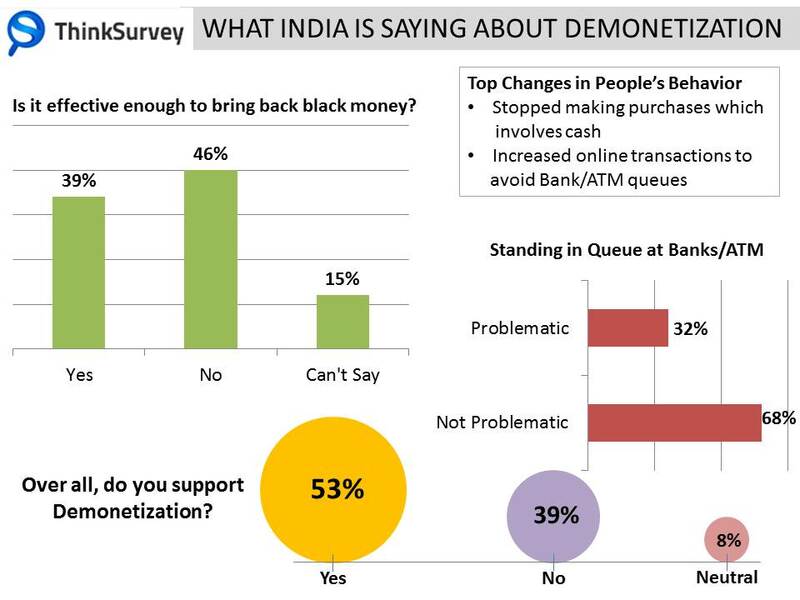 39% of all) are not supporting the demonetisation decision. Remaining 30 participants are yet to take a decision.